This double-sided chopsticks cleaning brush is easy to clean. Use ABS grip handle, strong and long-lasting, fine and flexible brush, do not hurt the tableware. 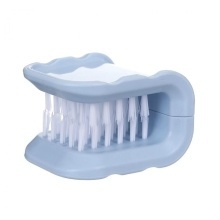 Double layer flexible and fine brush, fast cleaning and do not hurt the tableware. Multi-function use design, not only can wash chopsticks, but also can wash all kinds of kitchen utensils. U-shape grip handle design, fit palm, comfortable to use. Anti-skid material, when cleaning will not be affected by water and skid. Compact size, simple placement, easy to restore.